Today news broke of plans by the Silesian region to increase Stadion Śląski’s capacity. The notorious project ongoing since 1997 will see a rise from 47,000 to 54,477 already in 2017, but now there’s a scheme to make it a 60,000+ venue. Practical reasons? None really, few events in Poland require such capacity, the national team will (at best) play here once a year while local club Ruch would succeed if 20,000 came on average. Actual expectation by chairman Dariusz Smagorowicz expressed last week was of 8,000 per game at least. But in symbolic terms this would make Śląski the largest stadium in Poland, possibly eligible to hold a Champions League final someday. And it would be fairly cheap to do, without any structural changes. All it takes is reconfiguration of the seating to squeeze in additional 6,000. 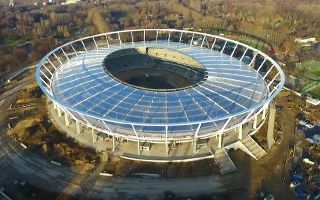 It’s no secret that Śląski will have a hard time competing for large events so boosting the image of Poland’s largest stadium sounds like a plan. That said, two can play this game. Operators of PGE Narodowy in Warsaw, current largest stadium, already last year confirmed they too could switch to 60,000+ with ease, should there be a need. While increased capacity could surely boost the stadium’s profile, there’s something ruining the perception already. On Friday construction of a prison-like fence around the stadium was complete. Worth PLN 7 million ($2m), the fence is 3.5m high (12 feet) and 1.6km long (1 mile). The only (!) reason it was built is for the police to have less trouble with fans giving one-another prohibited objects (alcohol, flares) through a less invasive fencing. Because, obviously, football fans will never find a way to get contraband through a fence, right? Interestingly, back in 2010, when StadiumDB.com was available only in Polish and we were strongly against the fence, the police actually wanted a concrete wall that would be even more disastrous aesthetically. But after efforts they were persuaded to accept a lighter metallic fence. Architects working on the stadium design protested the fence, but their efforts were not enough. With all the above said, Stadion Śląski is still Poland’s most legendary stadium in existence, the site of record crowds and historic wins by the national team and Silesian clubs. With several popular clubs in the region it can still successfully hold prestigious derbies and fill the calendar with major events catalyzing the local economy. Unfortunately there was no business model for the stadium when reconstruction began in 1997 and only in recent months a consultancy company created a framework for the stadium’s future non-event revenue sources. Viewing deck, zip-line, hovering LED façade and several other elements might prove successful in drawing people on a daily basis, but detailed cost is yet to be evaluated and approved. Early estimated put the adjustments at PLN 35 million ($9m), while the 1997-2017 stadium reconstruction will cost significantly over PLN 600 million ($158m) altogether.